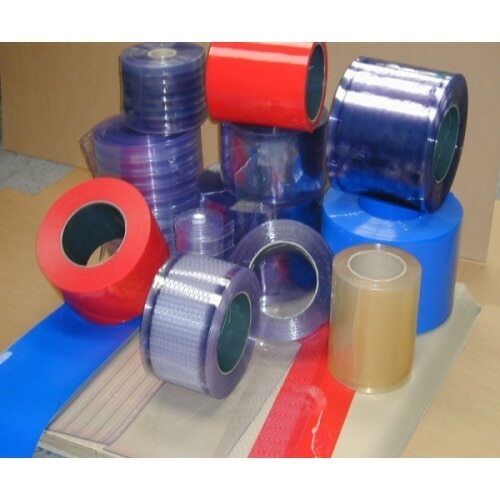 Flexible PVC sheeting is a self extinguishing plastic that has a multitude of uses whether you want to maintain an ambient temperature for your warehouse or cold store, keep out unwanted pests, restrict the movement of air pollutants or isolate noisy machinery, then we have the right type of flexible PVC for you. Clear flexible PVC is particularly useful where good light transmission is necessary or where visibility through the material is required. The most common use for this type of PVC is for strip curtains to prevent draughts and heat loss in commercial unit doorways. Forklifts and vehicles can still be driven safely through the clear PVC door strips as any obstruction on the other side can be clearly seen through the curtain. Clear PVC is becoming increasingly popular for use in horseboxes where it can be used as an attractive alternative to black insertion rubber for hanging partitions between the horses. We can offer a vast range of Flexible PVC in a variety of colours, thicknesses, widths and grades to suit most applications including welding bays and refrigeration purposes as low as -40c. The workhorse of the PVC family, from small interior pedestrian doorways to large exterior warehouse doors, clear PVC will cover most applications with ease. Clear grade PVC also offers good light transmission and is suitable for temperatures from +38C through to -10C. Offers all the benefits of clear grade but allows maximum ventilation in and out of the premises. 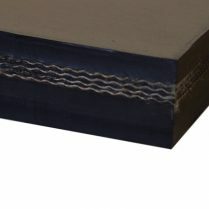 ‘Bumper strip’ or ‘Anti-scratch’ as it is sometimes known is the ideal solution for busy fork-lift traffic doorways. The double rib stripstake the impact from the vehicle/goods, minimising the damage to the PVC strip, therefore maintaining clarity and light transmission. All the same qualities and benefits of clear grade PVC (excluding light transmission) with the added benefits of improved health & safety, as coloured strips are far more visible and therefore ideal for fire-exits or identifying the edges of doorways for delivery vehicles and fork-lifts. During power cuts our ‘Glowstrip’ will highlight exits due to its ‘Glow in the dark’ properties. PVC sheet material is the ideal solution for racking seperation, roller strip doors, speed doors, and also the ever popular crash door, available in many widths and colours. Bespoke colours can also be manufactured to order, with a minimum order quantity of 3000kgs per colour. Please contact us for more information. We also offer a full range of curtain fixing plates in both stainless steel and polycarbonate materials. Hook-on, bolt-on and sliding fixing systems, basically all the component parts to make Safety Screens your “one stop shop” for all your PVC strip screening requirements.